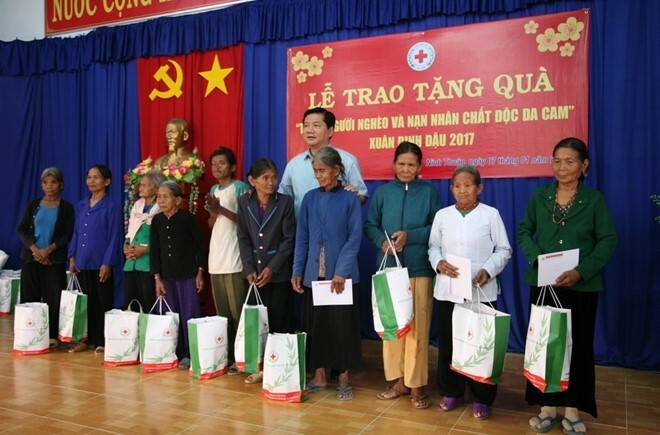 (VOVworld) – Leader of the Vietnam Red Cross Society and Ho Chi Minh City Saturday visited and delivered gifts to poor families and Agent Orange/Dioxin victims in Ma Noi commune, Ninh Son district, Ninh Thuan province. Ho Chi Minh City authority gave Ninh Thuan province 45,000 USD to support disadvantaged people during Tet. The Vietnam Red Cross Society prepared 200 gifts worth 50 USD each for poor families, Agent Orange/ Dioxin victims, and social contributors.